I’ve been craving, of late, the distinctive character of Macallan Scotch Whisky, and so went to the liquor store to satisfy that urge. I had fully intended on picking up the 12 year product when the Cask Strength bottle caught my eye! I immediately remembered that I’ve heard it is being discontinued in the U.S. and I needed to pick some up soon. I really don’t know why, but I don’t ever remember purchasing this product. I’ve seen it several times but with all of the different whisky out these days I’ve usually come away with something else. 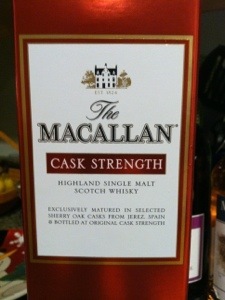 Now I love The Macallan, and I am very fond of the 12 year product that can be found almost anywhere. I think that perhaps this product may be in the same circumstance as Glenmorangie Astar, the alcohol content is high and the price is not low. However, these offerings are special and you should enjoy both before the disappear. It cost me about $95.00 USD. Nose: Dried fruit, with chocolate, orange, vanilla and wood spice. Palate: Rich and smooth, with fruit cake, vanilla and a hint of wood smoke. Finish: Full and lingering, with dried fruit and spice. In other words, classic Macallan mostly. The color along gets me going. I just love the color that the Sherry Oak casks from Jerez, Spain deliver! It is such a rich looking whisky. The notes on the bottle advise enjoying this dram with a splash of water. As usual, I will try it without and then I will take their advice and see which one I like better. WOW! It takes a remarkably well done whisky to accomplish the mouth-feel of this offering. And considering its alcohol content, I can keep this whisky in my mouth for as long as I want and enjoy it! That shows me the class of this whisky. It’s extremely well-rounded and beautifully complex. This product is so good, I don’t feel like adding water. I did, it does reveal some nice flavors, some that burst and some that linger. Very nice! I prefer it uncut though. I believe, age wise, this is a ten-year product. It does not state it on the bottle but the web-site shows it as a ten years product. I’m guessing that they removed the age statement for Americans because most Americans believe you can only drink a scotch that has aged at least 12 years. It’s an unfortunate misunderstanding to say the least. As I said earlier, this product, from my understanding, is being discontinued in the U.S.A. If you appreciate really good whisky, you will want one of these!